(Bloomberg) -- Turkish President Recep Tayyip Erdogan warned an opposition candidate seen likely to beat his party’s nominee in municipal elections this month that running for office won’t shield him from potential legal action. 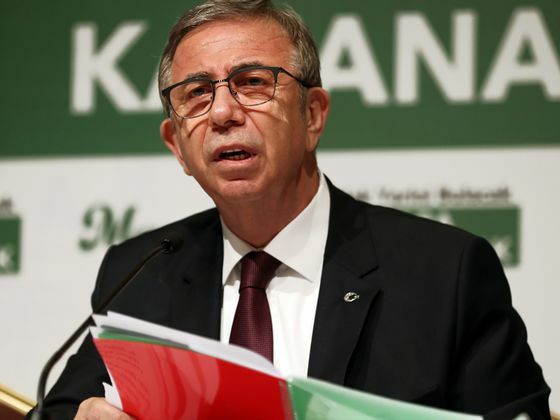 Erdogan said in a televised interview late on Monday that Mansur Yavas, jointly-backed by main opposition parties for mayor in Ankara, is facing criminal allegations and would have no immunity. Yavas is accused by a prosecutor of abusing his duty as a lawyer. He has denied the charge, describing it as an excuse to smear him before the vote. Most pollsters see Yavas leading the race with a comfortable margin against the ruling AKP’s candidate in the capital, a former minister of environment and urbanization. Yavas will “pay a serious price and make our fellow residents of Ankara to pay a price too, even if he can enter the elections,” Erdogan said. Erdogan’s critics accuse him of intimidating opponents as he seeks to amass greater control over the Middle East’s biggest economy. The government replaced dozens of mayors, mostly elected to run Kurdish-majority towns, in recent years with so-called trustees, charging them of having ties with the Kurdistan Workers’ Party, a designated terrorist group. Following Erdogan’s remarks, a Turkish official with direct knowledge of the matter said the prosecutor’s office in Ankara is conducting multiple probes against Yavas, which began after several criminal complaints were filed. A spokesperson for Yavas declined to comment when reached by phone.